The national debt of the United States was $22.03 trillion (as of April 4, 2019). This is the total debt, or unpaid borrowed funds, carried by the federal government of the United States, which is measured as the face value of the currently outstanding Treasury securities that have been issued by the Treasury and other federal government agencies. 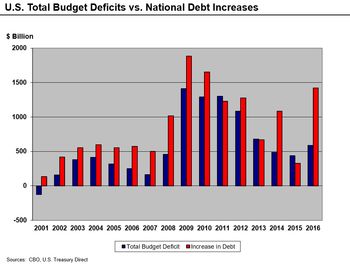 The terms national deficit and national surplus usually refer to the federal government budget balance from year to year, not the cumulative amount of debt. A deficit year increases the debt, while a surplus year decreases the debt as more money is received than spent. Debt held by the public, such as Treasury securities held by investors outside the federal government, including those held by individuals, corporations, the Federal Reserve System, and foreign, state and local governments. Debt held by government accounts or intragovernmental debt, are non-marketable Treasury securities held in accounts of programs administered by the federal government, such as the Social Security Trust Fund. Debt held by government accounts represents the cumulative surpluses, including interest earnings, of various government programs that have been invested in Treasury securities. In general, government debt increases as a result of government spending, and decreases from tax or other receipts, both of which fluctuate during the course of a fiscal year. In practice, Treasury securities are not issued or redeemed on a day-by-day basis, and may also be issued or redeemed as part of the federal government's macroeconomic management operations. Historically, the US public debt as a share of gross domestic product (GDP) has increased during wars and recessions, and subsequently declined. The ratio of debt to GDP may decrease as a result of a government surplus or due to growth of GDP and inflation. For example, debt held by the public as a share of GDP peaked just after World War II (113% of GDP in 1945), but then fell over the following 35 years. In recent decades, aging demographics and rising healthcare costs have led to concern about the long-term sustainability of the federal government's fiscal policies. The aggregate, gross amount that Treasury can borrow is limited by the United States debt ceiling. As of December 31, 2018, debt held by the public was $16.1 trillion and intragovernmental holdings were $5.87 trillion, for a total or "National Debt" of $21.97 trillion. Debt held by the public was approximately 76.4% of GDP in Q3 2018. In 2017, the US debt-to-GDP ratio was ranked 43rd highest out of 207 countries. The Congressional Budget Office forecast in April 2018 that the ratio will rise to nearly 100% by 2028, perhaps higher if current policies are extended beyond their scheduled expiration date. The United States has the largest external debt in the world and the 14th largest government debt as a % of GDP in the world. 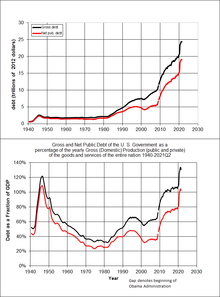 The amount of US public debt, measured as a percentage of GDP, held by the public since 1790. The United States government has continuously had a fluctuating public debt since its formation in 1789, except for about a year during 1835–1836, a period in which the nation, during the presidency of Andrew Jackson, completely paid the national debt. To allow comparisons over the years, public debt is often expressed as a ratio to gross domestic product (GDP). The United States public debt as a percentage of GDP reached its highest level during Harry Truman's first presidential term, during and after World War II. Public debt as a percentage of GDP fell rapidly in the post-World War II period, and reached a low in 1974 under Richard Nixon. Debt as a share of GDP has consistently increased since then, except during the presidencies of Jimmy Carter and Bill Clinton. Public debt rose sharply during the 1980s, as Ronald Reagan cut tax rates and increased military spending. It fell during the 1990s, due to decreased military spending, increased taxes and the 1990s boom. Public debt rose sharply during George W Bush's presidency and in the wake of the 2007–2008 financial crisis, with resulting significant tax revenue declines and spending increases. In their September 2018 monthly report published on October 5 and based on data from the Treasury Department's "Daily Treasury Statements" (DTS), the Congressional Budget Office (CBO) wrote that the federal budget deficit was c.$782 billion for the fiscal year 2018—which runs from October 2017 through September 2018. This is $116 billion more than in FY2017. :1 The Treasury statements as summarized by in the CBO report that corporate taxes for 2017 and 2018 declined by $92 billion representing a drop of 31%. The CBO added that "about half of the decline ... occurred since June" when some of the provisions of the Tax Cuts and Jobs Act of 2017 took effect, which included the "new lower corporate tax rate and the expanded ability to immediately deduct the full value of equipment purchases". According to articles in the Wall Street Journal and in the Business Insider, based on documents released on October 29, 2018 by the Treasury Department, the Department's new projection estimates that by the fourth quarter of the FY2018, it will issue c. $1.338 trillion in debt. This would be the highest debt issuance since 2010, when it reached $1.586 trillion. The Treasury anticipates that the total "net marketable debt"—net marketable securities—issued in the fourth quarter will reach $425 billion; which would raise the 2018 "total debt issuance" to over a trillion dollars of new debt, representing a "146% jump from 2017". According to the Journal that is the highest fourth quarter issuance "since 2008, at the height of the financial crisis." As cited by the Journal and the Business Insider, the primary drivers of new debt issuance are "stagnant", "sluggish tax revenues", a decrease in "corporate tax revenue", due to the GOP Tax Cuts and Jobs Act of 2017, the "bipartisan budget agreement", and "higher government spending". As of December 31, 2018, debt held by the public was $16.1 trillion and intragovernmental holdings were $5.87 trillion, for a total of $21.97 trillion. Debt held by the public was approximately 77% of GDP in 2017, ranked 43rd highest out of 207 countries. The Congressional Budget Office forecast in April 2018 that the ratio will rise to nearly 100% by 2028, perhaps higher if current policies are extended beyond their scheduled expiration date. The national debt can also be classified into marketable or non-marketable securities. Most of the marketable securities are Treasury notes, bills, and bonds held by investors and governments globally. The non-marketable securities are mainly the "government account series" owed to certain government trust funds such as the Social Security Trust Fund, which represented $2.82 trillion in 2017. The non-marketable securities represent amounts owed to program beneficiaries. For example, in the case of the Social Security Trust Fund, the payroll taxes dedicated to Social Security were credited to the Trust Fund upon receipt, but spent for other purposes. If the government continues to run deficits in other parts of the budget, the government will have to issue debt held by the public to fund the Social Security Trust Fund, in effect exchanging one type of debt for the other. Other large intragovernmental holders include the Federal Housing Administration, the Federal Savings and Loan Corporation's Resolution Fund and the Federal Hospital Insurance Trust Fund (Medicare). U.S. intra-governmental debt components, which totaled $5.47 trillion as of September 2016. This debt mainly represents obligations to Social Security recipients and retired federal government employees, including military. Only debt held by the public is reported as a liability on the consolidated financial statements of the United States government. Debt held by government accounts is an asset to those accounts but a liability to the Treasury; they offset each other in the consolidated financial statements. Government receipts and expenditures are normally presented on a cash rather than an accrual basis, although the accrual basis may provide more information on the longer-term implications of the government's annual operations. The United States public debt is often expressed as a ratio of public debt to gross domestic product (GDP). The ratio of debt to GDP may decrease as a result of a government surplus as well as due to growth of GDP and inflation. Under normal accounting rules, fully owned companies would be consolidated into the books of their owners, but the large size of Fannie and Freddie has made the U.S. government reluctant to incorporate Freddie and Fannie into its own books. When Freddie Mac and Fannie Mae required bail-outs, White House Budget Director Jim Nussle, on September 12, 2008, initially indicated their budget plans would not incorporate the GSE debt into the budget because of the temporary nature of the conservator intervention. As the intervention has dragged out, pundits have started to further question this accounting treatment, noting that changes in August 2012 "makes them even more permanent wards of the state and turns the government's preferred stock into a permanent, perpetual kind of security". The government controls the Public Company Accounting Oversight Board, which would normally criticize inconsistent accounting practices, but it does not oversee its own government's accounting practices or the standards set by the Federal Accounting Standards Advisory Board. The on- or off-balance sheet obligations of those two independent GSEs was just over $5 trillion at the time the conservatorship was put in place, consisting mainly of mortgage payment guarantees and agency bonds. The confusing independent but government-controlled status of the GSEs has resulted in investors of the legacy common shares and preferred shares launching various activist campaigns in 2014. U.S. federal government guarantees are not included in the public debt total, until such time as there is a call on the guarantees. For example, the U.S. federal government in late-2008 guaranteed large amounts of obligations of mutual funds, banks, and corporations under several programs designed to deal with the problems arising from the late-2000s financial crisis. The guarantee program lapsed at the end of 2012 when Congress declined to extend the scheme. The funding of direct investments made in response to the crisis, such as those made under the Troubled Assets Relief Program, are included in the debt. A timeline showing projected debt milestones from the CBO. The U.S. government is obligated under current law to make mandatory payments for programs such as Medicare, Medicaid and Social Security. The Government Accountability Office (GAO) projects that payouts for these programs will significantly exceed tax revenues over the next 75 years. The Medicare Part A (hospital insurance) payouts already exceed program tax revenues, and social security payouts exceeded payroll taxes in fiscal 2010. These deficits require funding from other tax sources or borrowing. The present value of these deficits or unfunded obligations is an estimated $45.8 trillion. This is the amount that would have had to be set aside in 2009 in order to pay for the unfunded obligations which, under current law, will have to be raised by the government in the future. Approximately $7.7 trillion relates to Social Security, while $38.2 trillion relates to Medicare and Medicaid. In other words, health care programs will require nearly five times more funding than Social Security. Adding this to the national debt and other federal obligations would bring total obligations to nearly $62 trillion. However, these unfunded obligations are not counted in the national debt, as shown in monthly Treasury reports of the national debt. GDP is a measure of the total size and output of the economy. One measure of the debt burden is its size relative to GDP, called the "debt-to-GDP ratio." Mathematically, this is the debt divided by the GDP amount. The Congressional Budget Office includes historical budget and debt tables along with its annual "Budget and Economic Outlook." Debt held by the public as a percentage of GDP rose from 34.7% GDP in 2000 to 40.5% in 2008 and 67.7% in 2011. Mathematically, the ratio can decrease even while debt grows if the rate of increase in GDP (which also takes account of inflation) is higher than the rate of increase of debt. Conversely, the debt to GDP ratio can increase even while debt is being reduced, if the decline in GDP is sufficient. According to the CIA World Factbook, during 2015, the U.S. debt to GDP ratio of 73.6% was the 39th highest in the world. This was measured using "debt held by the public." However, $1 trillion in additional borrowing since the end of FY 2015 has raised the ratio to 76.2% as of April 2016 [See Appendix#National debt for selected years]. Also, this number excludes state and local debt. According to the OECD, general government gross debt (federal, state, and local) in the United States in the fourth quarter of 2015 was $22.5 trillion (125% of GDP); subtracting out $5.25 trillion for intergovernmental federal debt to count only federal "debt held by the public" gives 96% of GDP. 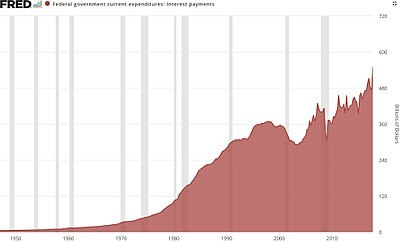 The ratio is higher if the total national debt is used, by adding the "intragovernmental debt" to the "debt held by the public." For example, on April 29, 2016, debt held by the public was approximately $13.84 trillion or about 76% of GDP. Intra-governmental holdings stood at $5.35 trillion, giving a combined total public debt of $19.19 trillion. U.S. GDP for the previous 12 months was approximately $18.15 trillion, for a total debt to GDP ratio of approximately 106%. Conceptually, an annual deficit (or surplus) should represent the change in the national debt, with a deficit adding to the national debt and a surplus reducing it. However, there is complexity in the budgetary computations that can make the deficit figure commonly reported in the media (the "total deficit") considerably different from the annual increase in the debt. 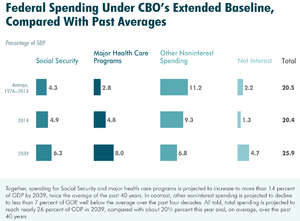 The major categories of differences are the treatment of the Social Security program, Treasury borrowing, and supplemental appropriations outside the budget process. Social Security payroll taxes and benefit payments, along with the net balance of the U.S. Postal Service, are considered "off-budget", while most other expenditure and receipt categories are considered "on-budget". The total federal deficit is the sum of the on-budget deficit (or surplus) and the off-budget deficit (or surplus). Since FY1960, the federal government has run on-budget deficits except for FY1999 and FY2000, and total federal deficits except in FY1969 and FY1998–FY2001. For example, in January 2009 the CBO reported that for fiscal year 2008 (FY2008) the "on-budget deficit" was $638 billion, offset by an "off-budget surplus" (mainly due to Social Security revenue in excess of payouts) of $183 billion, for a "total deficit" of $455 billion. This latter figure is the one commonly reported in the media. However, an additional $313 billion was required for "the Treasury actions aimed at stabilizing the financial markets," an unusually high amount due to the subprime mortgage crisis. This meant that the "debt held by the public" increased by $768 billion ($455B + $313B = $768B). The "off-budget surplus" was borrowed and spent (as is typically the case), increasing the "intra-governmental debt" by $183 billion. 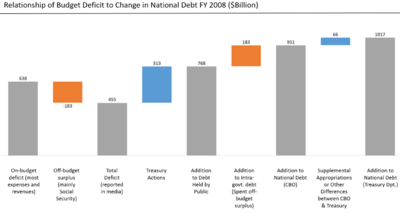 So the total increase in the "National debt" in FY2008 was $768B +$183B = $951 billion. The Treasury Department reported an increase in the National Debt of $1,017B for FY2008. The $66 billion difference is likely due to "supplemental appropriations" for the War on Terror, some of which were outside the budget process entirely until President Obama began including most of them in his FY2010 budget. In other words, spending the "off budget" Social Security surplus adds to the total national debt (by increasing the intragovernmental debt) while the "off-budget" surplus reduces the "total" deficit reported in the media. Certain spending called "supplemental appropriations" is outside the budget process entirely but adds to the national debt. Funding for the Iraq and Afghanistan wars was accounted for this way prior to the Obama administration. Certain stimulus measures and earmarks were also outside the budget process. 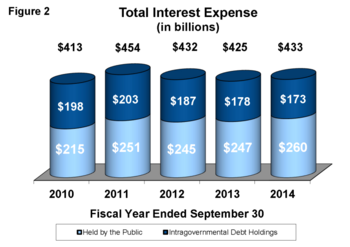 The federal government publishes the total debt owed (public and intragovernmental holdings) monthly. Since 2010, the U.S. Treasury has been obtaining negative real interest rates on government debt, meaning the inflation rate is greater than the interest rate paid on the debt. Such low rates, outpaced by the inflation rate, occur when the market believes that there are no alternatives with sufficiently low risk, or when popular institutional investments such as insurance companies, pensions, or bond, money market, and balanced mutual funds are required or choose to invest sufficiently large sums in Treasury securities to hedge against risk. Economist Lawrence Summers has stated that at such low interest rates, government borrowing actually saves taxpayer money and improves creditworthiness. In the late 1940s through the early 1970s, the US and UK both reduced their debt burden by about 30% to 40% of GDP per decade by taking advantage of negative real interest rates, but there is no guarantee that government debt rates will continue to stay this low. Between 1946 and 1974, the US debt-to-GDP ratio fell from 121% to 32% even though there were surpluses in only eight of those years which were much smaller than the deficits. Two economists, Jaromir Benes and Michael Kumhof, working for the International Monetary Fund, published a working paper called The Chicago Plan Revisited suggesting that the debt could be eliminated by raising bank reserve requirements and converting from fractional reserve banking to full reserve banking. Economists at the Paris School of Economics have commented on the plan, stating that it is already the status quo for coinage currency, and a Norges Bank economist has examined the proposal in the context of considering the finance industry as part of the real economy. A Centre for Economic Policy Research paper agrees with the conclusion that "no real liability is created by new fiat money creation, and therefore public debt does not rise as a result." The debt ceiling is a legislative mechanism to limit the amount of national debt that can be issued by the Treasury. In effect, it will restrain the Treasury from paying for expenditures after the limit has been reached, even if the expenditures have already been approved (in the budget) and have been appropriated. If this situation were to occur, it is unclear whether Treasury would be able to prioritize payments on debt to avoid a default on its debt obligations, but it would have to default on some of its non-debt obligations. As of October 2018, foreigners owned $6.2 trillion of U.S. debt, or approximately 39 percent of the debt held by the public of $16.1 trillion and 28 percent of the total debt of $21.8 trillion. At the close of 2018, the largest foreign holders were China ($1.13 trillion), Japan ($1.02 trillion), Brazil ($313 billion), and Ireland ($287 billion). Historically, the share held by foreign governments had grown over time, rising from 13 percent of the public debt in 1988 to 34 percent in 2015. In more recent years, foreign ownership has retreated both in percent of total debt and total dollar amounts. China's maximum holding of 9.1% or $1.3 trillion of US debt occurred in 2011, subsequently reduced to 5% in 2018. Japan's maximum holding of 7% or $1.2 trillion occurred in 2012, subsequently reduced to 4% in 2018. For the first time, in the second quarter of 2018, Foreign Direct Investment in the US was negative. Prior to the change in foreign investment trajectory, some analysts expressed concerns of exposure to potential financial or political risk should foreign banks stop buying Treasury securities or start selling them heavily. This was addressed in a June 2008 report issued by the Bank of International Settlements, which stated: "Foreign investors in U.S. dollar assets have seen big losses measured in dollars, and still bigger ones measured in their own currency. While unlikely, indeed highly improbable for public sector investors, a sudden rush for the exits cannot be ruled out completely." According to Paul Krugman, "America actually earns more from its assets abroad than it pays to foreign investors." Nonetheless, the country's net international investment position represents a debt of more than $9 trillion. Congressional Budget Office (CBO) baseline scenario comparisons: June 2017 (essentially the deficit trajectory that President Trump inherited from President Obama), April 2018 (which reflects Trump's tax cuts and spending bills), and April 2018 alternate scenario (which assumes extension of the Trump tax cuts, among other current policy extensions). Interest to GDP, a measure of debt burden, was very low in 2015 but is projected to rise with both interest rates and debt levels over the 2016–2026 period. The budget deficit in fiscal 2018 (which runs from October 1, 2017 to September 30, 2018, the first year budgeted by President Trump) is forecast to be $804 billion, an increase of $139 billion (21%) from the $665 billion in 2017 and up $242 billion (39%) over the previous baseline forecast (June 2017) of $580 billion for 2018. The June 2017 forecast was essentially the budget trajectory inherited from President Obama; it was prepared prior to the Tax Act and other spending increases under President Trump. For the 2018–2027 period, CBO projects the sum of the annual deficits (i.e., debt increase) to be $11.7 trillion, an increase of $1.6 trillion (16%) over the previous baseline (June 2017) forecast of $10.1 trillion. The $1.6 trillion debt increase includes three main elements: 1) $1.7 trillion less in revenues due to the tax cuts; 2) $1.0 trillion more in spending; and 3) Partially offsetting incremental revenue of $1.1 trillion due to higher economic growth than previously forecast. Debt held by the public is expected to rise from 78% of GDP ($16 trillion) at the end of 2018 to 96% GDP ($29 trillion) by 2028. That would be the highest level since the end of World War II. CBO estimated under an alternative scenario (in which policies in place as of April 2018 are maintained beyond scheduled initiation or expiration) that deficits would be considerably higher, rising by $13.7 trillion over the 2018–2027 period, an increase of $3.6 trillion over the June 2017 baseline forecast. Maintaining current policies for example would include extending the individual Trump tax cuts past their scheduled expiration in 2025, among other changes. The debt increase of $1.6 trillion represents approximately $12,700 per household (assuming 126.2 million households in 2017), while the $3.6 trillion represents $28,500 per household. At 78 percent of gross domestic product (GDP), federal debt held by the public is now at its highest level since shortly after World War II. If current laws generally remained unchanged, the Congressional Budget Office projects, growing budget deficits would boost that debt sharply over the next 30 years; it would approach 100 percent of GDP by the end of the next decade and 152 percent by 2048. That amount would be the highest in the nation’s history by far. Moreover, if lawmakers changed current law to maintain certain policies now in place—preventing a significant increase in individual income taxes in 2026, for example—the result would be even larger increases in debt. Over the long-term, the CBO projects that interest expense and mandatory spending categories (e.g., Medicare, Medicaid and Social Security) will continue to grow relative to GDP, while discretionary categories (e.g., Defense and other Cabinet Departments) continue to fall relative to GDP. Debt is projected to continue rising relative to GDP under the above two scenarios, although the CBO did also offer other scenarios that involved austerity measures that would bring the debt to GDP ratio down. An increased risk of a sudden fiscal crisis, in which investors demand higher interest rates. Many American and other economic analysts have expressed concerns on account of the People's Republic of China's "extensive" holdings of United States government debt, as part of their reserves. The National Defense Authorization Act of the fiscal year 2012 included a provision requiring the Secretary of Defense to conduct a "national security risk assessment of U.S. federal debt held by China." The Department issued its report in July 2012, stating that "attempting to use U.S. Treasury securities as a coercive tool would have limited effect and likely would do more harm to China than to the United States. As the threat is not credible and the effect would be limited even if carried out, it does not offer China deterrence options, whether in the diplomatic, military, or economic realms, and this would remain true both in peacetime and in scenarios of crisis or war." A significant number of economists and analysts dismiss any and all concerns over foreign holdings of United States government debt denominated in U.S. dollars, including China's holdings. According to the Government Accountability Office (GAO), the United States is on a "fiscally unsustainable" path because of projected future increases in Medicare and Social Security spending. According to the Treasury report in early October, summarized by Business Insider's Bob Bryan, the US federal budget deficit rose as a result of the Tax Cuts and Jobs Act of 2017 signed into law by President Donald Trump on December 22, 2017 and the Consolidated Appropriations Act, 2018 signed into law on March 23, 2018. Debt levels may affect economic growth rates. In 2010, economists Kenneth Rogoff and Carmen Reinhart reported that among the 20 developed countries studied, average annual GDP growth was 3–4% when debt was relatively moderate or low (i.e. under 60% of GDP), but it dips to just 1.6% when debt was high (i.e., above 90% of GDP). In April 2013, the conclusions of Rogoff and Reinhart's study came into question when a coding error in their original paper was discovered by Herndon, Ash and Pollin of the University of Massachusetts, Amherst. Herndon, Ash and Pollin found that after correcting for errors and unorthodox methods used, there was no evidence that debt above a specific threshold reduces growth. Reinhart and Rogoff maintain that after correcting for errors, a negative relationship between high debt and growth remains. However, other economists, including Paul Krugman, have argued that it is low growth which causes national debt to increase, rather than the other way around. Commenting on fiscal sustainability, former Federal Reserve Chairman Ben Bernanke stated in April 2010 that "Neither experience nor economic theory clearly indicates the threshold at which government debt begins to endanger prosperity and economic stability. But given the significant costs and risks associated with a rapidly rising federal debt, our nation should soon put in place a credible plan for reducing deficits to sustainable levels over time." Despite rising debt levels, interest costs have remained at approximately 2008 levels (around $450 billion in total) due to lower than long-term interest rates paid on government debt in recent years. However, interest rates may return to higher historical levels. The cost of servicing the U.S. national debt can be measured in various ways. 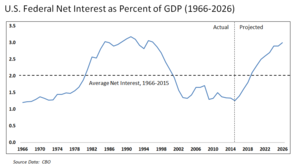 The CBO analyzes net interest as a percentage of GDP, with a higher percentage indicating a higher interest payment burden. During 2015, this was 1.3% GDP, close to the record low 1.2% of the 1966–1968 era. The average from 1966 to 2015 was 2.0% of GDP. However, the CBO estimated in 2016 that the interest amounts and % GDP will increase significantly over the following decade as both interest rates and debt levels rise: "Interest payments on that debt represent a large and rapidly growing expense of the federal government. CBO's baseline shows net interest payments more than tripling under current law, climbing from $231 billion in 2014, or 1.3 percent of GDP, to $799 billion in 2024, or 3.0 percent of GDP—the highest ratio since 1996." Economists also debate the definition of public debt. Krugman argued in May 2010 that the debt held by the public is the right measure to use, while Reinhart has testified to the President's Fiscal Reform Commission that gross debt is the appropriate measure. The Center on Budget and Policy Priorities (CBPP) cited research by several economists supporting the use of the lower debt held by the public figure as a more accurate measure of the debt burden, disagreeing with these Commission members. There is debate regarding the economic nature of the intragovernmental debt, which was approximately $4.6 trillion in February 2011. For example, the CBPP argues: that "large increases in [debt held by the public] can also push up interest rates and increase the amount of future interest payments the federal government must make to lenders outside of the United States, which reduces Americans' income. By contrast, intragovernmental debt (the other component of the gross debt) has no such effects because it is simply money the federal government owes (and pays interest on) to itself." However, if the U.S. government continues to run "on budget" deficits as projected by the CBO and OMB for the foreseeable future, it will have to issue marketable Treasury bills and bonds (i.e., debt held by the public) to pay for the projected shortfall in the Social Security program. This will result in "debt held by the public" replacing "intragovernmental debt". For every dollar of debt held by the public, there is a government obligation (generally marketable Treasury securities) counted as an asset by investors. Future generations benefit to the extent these assets are passed on to them. As of 2010, approximately 72% of the financial assets were held by the wealthiest 5% of the population. This presents a wealth and income distribution question, as only a fraction of the people in future generations will receive principal or interest from investments related to the debt incurred today. To the extent the U.S. debt is owed to foreign investors (approximately half the "debt held by the public" during 2012), principal and interest are not directly received by U.S. heirs. Higher debt levels imply higher interest payments, which create costs for future taxpayers (e.g., higher taxes, lower government benefits, higher inflation, or increased risk of fiscal crisis). To the extent the borrowed funds are invested today to improve the long-term productivity of the economy and its workers, such as via useful infrastructure projects or education, future generations may benefit. For every dollar of intragovernmental debt, there is an obligation to specific program recipients, generally non-marketable securities such as those held in the Social Security Trust Fund. Adjustments that reduce future deficits in these programs may also apply costs to future generations, via higher taxes or lower program spending. Krugman wrote in March 2013 that by neglecting public investment and failing to create jobs, we are doing far more harm to future generations than merely passing along debt: "Fiscal policy is, indeed, a moral issue, and we should be ashamed of what we're doing to the next generation's economic prospects. But our sin involves investing too little, not borrowing too much." Young workers face high unemployment and studies have shown their income may lag throughout their careers as a result. Teacher jobs have been cut, which could affect the quality of education and competitiveness of younger Americans. The US has never fully defaulted. 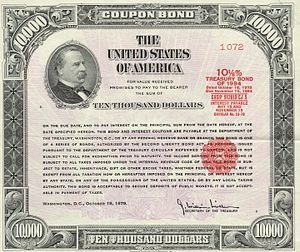 In April 1979, however, the United States may have technically defaulted on $122 million in Treasury bills, which was less than 1% of U.S. debt. The Treasury Department characterized it as a delay rather than as a default, but it did have consequences for short-term interest rates, which jumped 0.6%. Others view it as a temporary, partial default. On June 25, 2014, the BEA announced: "[On July 30, 2014, i]n addition to the regular revision of estimates for the most recent 3 years and for the first quarter of 2014, GDP and select components will be revised back to the first quarter of 1999. Fiscal years 1940–2009 GDP figures were derived from February 2011 Office of Management and Budget figures which contained revisions of prior year figures due to significant changes from prior GDP measurements. Fiscal years 1950–2010 GDP measurements were derived from December 2010 Bureau of Economic Analysis figures which also tend to be subject to revision, especially more recent years. Afterwards the OMB figures were revised back to 2004 and the BEA figures (in a revision dated July 31, 2013) were revised back to 1947. Regarding estimates recorded in the GDP column (the last column) marked with a "~" symbol, absolute differences from advance (one month after) BEA reports of GDP percent change to current findings (as of November 2013) found in revisions are stated to be 1.3% ± 2.0% or a 95% probability of being within the range of 0.0–3.3%, assuming the differences to occur according to standard deviations from the average absolute difference of 1.3%. E.g. with an advance report of a $400 billion increase of a $10 trillion GDP, for example, one could be 95% confident that the range in which the exact GDP dollar amount lies would be 0.0 to 3.3% different than 4.0% (400 ÷ 10,000) or within the range of $0 to $330 billion different than the hypothetical $400 billion (a range of $70–730 billion). Two months after, with a revised value, the range of potential difference from the stated estimate shrinks, and three months after with another revised value the range shrinks again. Fiscal years 1940–1970 begin July 1 of the previous year (for example, Fiscal Year 1940 begins July 1, 1939 and ends June 30, 1940); fiscal years 1980–2010 begin October 1 of the previous year. Intragovernmental debts before the Social Security Act are presumed to equal zero. 1909–1930 calendar year GDP estimates are from MeasuringWorth.com Fiscal Year estimates are derived from simple linear interpolation. (a1) Audited figure was "about $5,659 billion." (a2) Audited figure was "about $5,792 billion." (a3) Audited figure was "about $6,213 billion." (a) Audited figure was said to be "about" the stated figure. (a4) Audited figure was "about $7,918 billion." (a5) Audited figure was "about $8,493 billion." (a6) Audited figure was "about $8,993 billion." (a7) Audited figure was "about $10,011 billion." (a8) Audited figure was "about $11,898 billion." (a9) Audited figure was "about $13,551 billion." (a10) GAO affirmed Bureau of the Public debt figure as $14,781 billion. (a11) GAO affirmed Bureau of the Public debt figure as $16,059 billion. (a12) GAO affirmed Bureau of the Fiscal Service's figure as $16,732 billion. (a13) GAO affirmed Bureau of the Fiscal Service's figure as $17,810 billion. (a14) GAO affirmed Bureau of the Fiscal Service's figure as $18,138 billion. U.S. official gold reserves as of 31 July 2014[update] total 261.5 million troy ounces with a book value of approximately $11.04 billion. Foreign exchange reserves $140 billion as of September 2014[update]. The national debt equates to $59,143 per person U.S. population, or $159,759 per member of the U.S. working taxpayers, as of March 2016. In 2008, $242 billion was spent on interest payments servicing the debt, out of a total tax revenue of $2.5 trillion, or 9.6%. Including non-cash interest accrued primarily for Social Security, interest was $454 billion or 18% of tax revenue. Total U.S. household debt, including mortgage loan and consumer debt, was $11.4 trillion in 2005. By comparison, total U.S. household assets, including real estate, equipment, and financial instruments such as mutual funds, was $62.5 trillion in 2005. Total U.S. Consumer Credit Card revolving credit was $931.0 billion in April 2009. 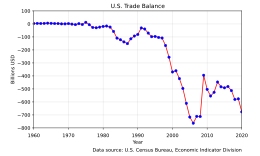 The U.S. balance of trade deficit in goods and services was $725.8 billion in 2005. According to the U.S. Department of Treasury Preliminary 2014 Annual Report on U.S. Holdings of Foreign Securities, the United States valued its foreign treasury securities portfolio at $2.7 trillion. The largest debtors are Canada, the United Kingdom, Cayman Islands, and Australia, whom account for $1.2 trillion of sovereign debt owed to residents of the U.S. The entire public debt in 1998 was attributable to the cost of research, development, and deployment of U.S. nuclear weapons and nuclear weapons-related programs during the Cold War. A 1998 Brookings Institution study published by the Nuclear Weapons Cost Study Committee (formed in 1993 by the W. Alton Jones Foundation), calculated that total expenditures for U.S. nuclear weapons from 1940 to 1998 was $5.5 trillion in 1996 Dollars. The total public debt at the end of fiscal year 1998 was $5,478,189,000,000 in 1998 Dollars or $5.3 trillion in 1996 Dollars. On July 29, 2016, the BEA released a revision to 2013–2016 GDP figures. The figures for this table were corrected the next week with changes to figures in those fiscal years. On July 30, 2015, the BEA released a revision to 2012–2015 GDP figures. The figures for this table were corrected on that day with changes to FY 2013 and 2014, but not 2015 as FY 2015 is updated within a week with the release of debt totals for July 31, 2015. On June 25, 2014, the BEA announced a 15-year revision of GDP figures would take place on July 31, 2014. The figures for this table were corrected after that date with changes to FY 2000, 2003, 2008, 2012, 2013 and 2014. The more precise FY 1999–2014 debt figures are derived from Treasury audit results. The variations in the 1990s and FY 2015 figures are due to double-sourced or relatively preliminary GDP figures respectively. A comprehensive revision GDP revision dated July 31, 2013 was described on the Bureau of Economic Analysis website. In November 2013 the total debt and yearly debt as a percentage of GDP columns of this table were changed to reflect those revised GDP figures. ^ "Debt to the Penny". United States Department of the Treasury. Retrieved April 4, 2019. ^ "Federal debt basics – How large is the federal debt?". Government Accountability Office. Retrieved April 28, 2012. ^ "Historical Tables – Table 1.2 – Summary of Receipts, Outlays, and Surpluses or Deficits (-) as Percentages of GDP: 1930–2017" (PDF). Office of Management and Budget. Archived from the original (PDF) on April 17, 2012. Retrieved April 16, 2012. ^ "The 2014 Long-Term Budget Outlook in 26 Slides – Congressional Budget Office". cbo.gov. ^ About 0.8% of debt ($1009 billion) is not covered by the ceiling, per The Debt Limit: History and Recent Increases, p. 4. (Note: This includes pre-1917 debt), fpc.state.gov; accessed August 24, 2016. ^ a b c d "The Budget and Economic Outlook: 2018 to 2028 – Congressional Budget Office". www.cbo.gov. 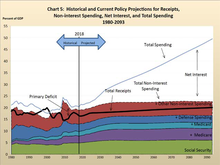 ^ "Congressional Budget Office – Historical Data on the Federal Debt". cbo.gov. 2010. Retrieved January 3, 2012. ^ a b Monthly Budget Review for September 2018 (PDF) (Report). Congressional Budget Office. October 5, 2018. p. 5. Retrieved October 30, 2018. ^ a b c d e f Davidson, Kate (October 29, 2018). "Treasury Expects to Issue Over $1 Trillion in Debt in 2018". Washington, DC: Wall Street Journal. Retrieved October 30, 2018. Debt issuance this year could be highest since 2010, the Treasury said, as higher government spending and stagnant tax revenues have pushed the deficit higher. ^ a b c d e Bryan, Bob (October 30, 2018). "The US will issue over $1.3 trillion in new debt in 2018, the highest amount since the depths of the recession". Business Insider. Retrieved October 30, 2018. ^ Daily Treasury Statement (DTS) (PDF) (Report). Treasury Department. October 29, 2018. Retrieved October 30, 2018. ^ The Bureau of the Fiscal Service (July 31, 2018). "Debt to the Penny". www.treasurydirect.gov. Treasury Department. Retrieved October 30, 2018. ^ "The 2012 Annual Report of the Board of Trustees of the Federal Old-Age and Survivors Insurance and Federal Disability Insurance Trust Funds" (PDF). Ssa.gov. Retrieved August 27, 2016. ^ "Social Security Trust Fund 2010 Report Summary". Ssa.gov. Retrieved May 18, 2011. ^ "Federal debt basics – What is the difference between the two types of federal debt?". Government Accountability Office. Retrieved April 28, 2012. ^ "Measuring the Deficit: Cash vs. Accrual". Government Accountability Office. Retrieved January 19, 2011. ^ Fannie Mae, Freddie Mac to Be Kept Off Budget, White House Says (September 12, 2008), Bloomberg.com. ^ Barr, Colin (September 7, 2008). "Paulson readies the 'bazooka'", CNN.com; retrieved January 17, 2011. ^ Timiraos, Nick (March 3, 2014). "Investor Fires Salvo Against Fannie, Freddie-Viewed March 2014". WSJ. Retrieved August 24, 2016. ^ a b Congress of the United States, Government Accountability Office (February 13, 2009). "The federal government's financial health: a citizen's guide to the 2008 financial report of the United States government", pp. 7–8, gao.gov; retrieved February 1, 2011. ^ Peter G. Peterson Foundation (April 2010). "Citizen's guide 2010: Figure 10 p. 16". Peter G. Peterson Foundation website; retrieved February 5, 2011. ^ "Government – Debt Position and Activity Report". www.treasurydirect.gov. ^ CBO – The Budget and Economic Outlook: Fiscal Years 2012 to 2022 – See Historical Budget Data Supplement, Cbo.gov, January 2012. ^ "The World Factbook". Central Intelligence Agency. ^ OECD. "OECD Statistics". Stats.oecd.org. Retrieved August 27, 2016. United States Department of the Treasury, Bureau of the Public Debt (December 2010). "The debt to the penny and who holds it". TreasuryDirect. Retrieved August 26, 2012. ^ a b "CBO Budget and Economic Outlook 2009–2019". CBO. Retrieved November 21, 2016. ^ Table 1.1 – Summary of Receipts, Outlays, and Surpluses or Deficits (-): 1789–2017 Archived July 6, 2012, at the Wayback Machine, Whitehouse.gov; accessed August 24, 2016. ^ "TreasuryDirect Historical Debt Outstanding". Treasury Direct. Retrieved November 26, 2016. ^ a b "Money in budgets, but supplementals aren't going away". Politifact. Retrieved November 26, 2016. ^ "Treasurydirect.gov". Treasurydirect.gov. Retrieved May 18, 2011. ^ "Why the U.S. Government Never, Ever Has to Pay Back All Its Debt", The Atlantic, February 1, 2013. ^ Jaromir Benes and Michael Kumhof (August 2012) "The Chicago Plan Revisited", International Monetary Fund working paper WP/12/202; accessed November 6, 2016. ^ "The economic crisis: How to stimulate economies without increasing public debt" Archived September 16, 2012, at the Wayback Machine, Centre for Economic Policy Research, August 2012. ^ "Treasury Direct-Monthly Statement of the Public Debt Held by the U.S." (PDF). September 2014. Retrieved November 30, 2014. ^ a b Major Foreign Holders of Treasury Securities (Report). Department of the Treasury/Federal Reserve Board. April 15, 2019. ^ Amadeo, Kimberly (January 10, 2011). "The U.S. debt and how it got so big". About.com. Retrieved July 7, 2007. ^ Schoen, John W. (March 4, 2007) "Just who owns the U.S. national debt?" MSNBC.com; retrieved January 17, 2011. ^ "foreign debt by year". ^ Krugman, Paul (January 1, 2012). "Nobody Understands Debt". New York Times. Retrieved February 4, 2012. 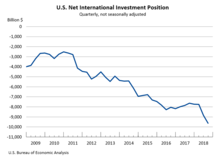 ^ "US Net International Investment Position from BEA". February 1, 2019. Retrieved April 1, 2019. ^ a b CBO The 2018 Long-Term Budget Outlook, cbo.gov; accessed March 1, 2018. ^ a b Huntley, Jonathan (July 27, 2010). "Federal debt and the risk of a fiscal crisis". Congressional Budget Office: Macroeconomic Analysis Division; retrieved February 2, 2011. ^ "... Should Americans be concerned that China has started dumping some of its Treasury holdings? After all, it raises serious questions about whether China will keep lending Washington money to help finance the federal deficit in the future. ": From "China is dumping U.S. debt", CNN.com, September 11, 2015. ^ :"... What about indebtedness to foreigners? ... To acquire [U.S. gov't bonds], China must export goods to us, not offset by equivalent imports. That is a cost to China. It's a cost Beijing is prepared to pay, for its own reasons: export industries promote learning, technology transfer and product quality improvement, and they provide jobs to migrants from the countryside. But that's China's business. For China, the bonds themselves are a sterile hoard. There is almost nothing that Beijing can do with them; ... its stock of T-bonds will just go on growing. And we will pay interest on it, not with real effort but by typing numbers into computers. There is no burden associated with this; not now and not later." From "In Defense of Deficits" by James K. Galbraith, The Nation, March 4, 2010. ^ "... The Chinese buy U.S. T-securities by transferring U.S. dollars (not yuan) from their checking account at the Federal Reserve Bank to China's T-security account, also at the Federal Reserve Bank. When[ever] the Chinese redeem those T-securities, the money is transferred back to China's checking account at the Fed. During the entire purchase and redemption process, the dollars never leave the Fed." "What Policies for Global Prosperity?" by Warren Mosler, September 23, 2010. ^ Pullen, John Patrick (December 20, 2017). "Here's When the GOP Tax Reform Bill Will Take Effect". Fortune. Retrieved December 23, 2017. ^ Werner, Erica; DeBonis, Mike (March 22, 2018). "House approves jam-packed $1.3 trillion spending bill". The Washington Post. ISSN 0190-8286. Retrieved October 30, 2018. ^ Bryan, Bob (October 15, 2018). "The US budget deficit ballooned to $779 billion this year, the highest since 2012, driven by Trump's tax law and the massive budget deal". Business Insider. Retrieved October 30, 2018. ^ U.S. House of Representatives Republican Caucus (May 27, 2010). "The perils of rising government debt", budget.house.gov; retrieved February 2, 2011. ^ Herndon, Thomas. "Herndon Responds To Reinhart Rogoff". Business Insider. Retrieved April 22, 2013. ^ Weisenthal, Joe. "Reinhart And Rogoff Admit Excel Blunder". Business Insider. Retrieved April 22, 2013. ^ Herndon, Thomas, Michael Ash, and Robert Pollin, "Does High Public Debt Consistently Stifle Economic Growth? A Critique of Reinhart and Rogoff" Archived April 18, 2013, at the Wayback Machine, University of Massachusetts – Amherst Department of Economics, April 15, 2013. ^ "Reinhart-Rogoff recrunch the numbers". ^ a b Krugman, Paul (May 27, 2010). "Bad analysis at the deficit commission". The New York Times: The Opinion Pages: Conscience of a Liberal Blog. Retrieved February 9, 2011. ^ Vikas Bajaj (April 17, 2013) "Does High Debt Cause Slow Growth? ", The New York Times; retrieved May 7, 2013. ^ Matthew O'Brien, "Forget Excel: This Was Reinhart and Rogoff's Biggest Mistake", The Atlantic; accessed November 6, 2016. ^ Bernanke, Ben S. (April 27, 2010). "Speech before the National Commission on Fiscal Responsibility and Reform: Achieving fiscal sustainability", Federalreserve.gov; retrieved February 2, 2011. ^ Ferguson, Niall (November 3, 2009). "Interview with Charlie Rose" Archived January 19, 2011, at the Wayback Machine. Charlie Rose [website]; retrieved February 6, 2011. ^ CBO-Updated Budget Projections 2016–2026, cbo.gov; retrieved May 11, 2016. ^ CBO-Projection of Federal Interest Payments, cbo.gov, September 3, 2014. ^ a b Horney, James R. (May 27, 2010). "Recommendation that president's fiscal commission focus on gross debt is misguided", Center on Budget and Policy Priorities [website]; retrieved February 9, 2011. ^ United States Treasury, Bureau of the Public Debt (April 30, 2010). "Monthly statement of public debt of the United States", TreasuryDirect; retrieved February 9, 2011. ^ "CBO-Social Security Policy Options-July 2010" (PDF). Retrieved May 18, 2011. ^ Gordon, John Steele. "A Short Primer on the National Debt". Wsj.com. Retrieved August 27, 2016. ^ a b "Debt Is (Mostly) Money We Owe to Ourselves". Krugman.blogs.nytimes.com. Retrieved August 27, 2016. ^ "Who Rules America: Wealth, Income, and Power". Ucsc.edu. Retrieved August 27, 2016. ^ Baker, Dean. "David Brooks Is Projecting His Self Indulgence Again". cepr.net. Retrieved September 23, 2016. ^ "Cheating Our Children". The New York Times. March 29, 2013. ^ Carney, John. "Has the United States Ever Defaulted on Its Debt?". CNBC. Retrieved January 18, 2013. ^ Comstock, Courtney. "10 Things You Need To Know About The Debt Ceiling". The Fiscal Times. Retrieved January 18, 2013. ^ Zweig, Jason. "Own Government Bonds? Here's Why You Should Be Worried". The Wall Street Journal. Retrieved January 18, 2013. ^ Marron, Donald. "The Day the United States Defaulted on Treasury Bills". Retrieved January 18, 2013. ^ O'brien, Matthew. "Here's What Happened the Last Time the U.S. Defaulted on Its Debt". The Atlantic. Retrieved January 18, 2013. ^ Siegel, Robert. "When Did The U.S. Last Default On Treasury Bonds?". NPR. Retrieved January 18, 2013. ^ a b United States Department of the Treasury, Bureau of the Public Debt (2010). "Government – Historical Debt Outstanding – Annual", TreasuryDirect.gov; retrieved January 16, 2011. ^ a b The Executive Office of the President of the United States, Office of Management and Budget (April 10, 2013). "Federal debt at the end of year: 1940–2018"; "Gross domestic product and deflators used in the historical tables: 1940–2018", Budget of the United States Government: Fiscal Year 2014: Historical Tables, pp. 143–44, 215–16, Government Printing Office website; retrieved November 27, 2013. ^ The Executive Office of the President of the United States, Office of Management and Budget (February 14, 2010). "Historical Tables: Table 7-1; 10-1", The White House; retrieved February 15, 2010. ^ a b United States Department of Commerce, Bureau of Economic Analysis. "National Economic Accounts: Gross Domestic Product: Current-dollar and 'real' GDP", BEA.gov; retrieved August 3, 2011. ^ MeasuringWorth.com (December 14, 2010) "What was the U.S. GDP then? ", MeasuringWorth.com; retrieved January 30, 2011. ^ United States Congress, Government Accountability Office (March 1, 2001). Financial Audit: Bureau of the Public Debt's Fiscal Years 2000 and 1999 Schedules of Federal Debt GAO-01-389 United States Government Accountability Office (GAO); retrieved August 6, 2012. ^ a b United States Congress, Government Accountability Office (November 1, 2002). Financial Audit: Bureau of the Public Debt's Fiscal Years 2002 and 2001 Schedules of Federal Debt GAO-03-199 United States Government Accountability Office (GAO); retrieved February 2, 2011. ^ United States Congress, Government Accountability Office (November 5, 2004). Financial Audit: Bureau of the Public Debt's Fiscal Years 2004 and 2003 Schedules of Federal Debt GAO-05-116 United States Government Accountability Office (GAO); retrieved January 16, 2011. ^ a b United States Congress, Government Accountability Office (November 7, 2006). Financial Audit: Bureau of the Public Debt's Fiscal Years 2006 and 2005 Schedules of Federal Debt GAO-07-127 United States Government Accountability Office (GAO); retrieved February 2, 2011. ^ a b c United States Congress, Government Accountability Office (November 7, 2008). Financial Audit: Bureau of the Public Debt's Fiscal Years 2008 and 2007 Schedules of Federal Debt GAO-09-44 United States Government Accountability Office (GAO); retrieved January 29, 2011. ^ United States Congress, Government Accountability Office (November 10, 2009). Financial Audit: Bureau of the Public Debt's Fiscal Years 2009 and 2008 Schedules of Federal Debt GAO-10-88 United States Government Accountability Office (GAO); retrieved February 2, 2011. ^ United States Congress, Government Accountability Office (November 8, 2010). Financial Audit: Bureau of the Public Debt's Fiscal Years 2010 and 2009 Schedules of Federal Debt GAO-11-52 United States Government Accountability Office (GAO); retrieved February 2, 2011. ^ a b United States Congress, Government Accountability Office (November 8, 2012). Financial Audit: Bureau of the Public Debt's Fiscal Years 2012 and 2011 Schedules of Federal Debt GAO-13-114 United States Government Accountability Office (GAO); retrieved November 27, 2013. ^ United States Congress, Government Accountability Office (December 12, 2013). Financial Audit: Bureau of the Fiscal Service's Fiscal Years 2013 and 2012 Schedules of Federal Debt GAO-14-173, United States Government Accountability Office (GAO); retrieved July 2, 2014. ^ GAO-Financial Audit-Bureau of the Fiscal Service's Fiscal Years 2014 and 2013 Schedules of Federal Debt, treasurydirect.gov, November 2014. ^ GAO-Financial Audit-Bureau of the Fiscal Service's Fiscal Years 2015 and 2014 Schedules of Federal Debt, treasurydirect.gov, November 2015. ^ "Government – Historical Debt Outstanding – Annual 2000–2015". ^ "Government – November". treasurydirect.gov. ^ "GDP (Official Exchange Rate)". CIA World Factbook. ^ "GDP (Purchasing Power Parity)". CIA World Factbook. ^ U.S. Department of the Treasury, Bureau of the Fiscal Service (July 13, 2014). "Status report of U.S. Treasury-owned gold". ^ U.S. Department of the Treasury, Bureau of the Fiscal Service (March 14, 2016). "United States Debt Clock". ^ Board of Governors of the Federal Reserve System (March 9, 2006). "Z.1-Flow of Funds Accounts of the United States", pp. 8, 102. Board of Governors of the Federal Reserve System [website]; retrieved January 29, 2011. ^ Board of Governors of the Federal Reserve System (June 5, 2009). "G.19-Consumer Credit". Board of Governors of the Federal Reserve System [website]; retrieved January 30, 2011. ^ United States Department of Commerce, United States Census Bureau (February 19, 2006). Archived copy at the Portuguese Web Archive (July 10, 2009).. U.S. Census Bureau [website]; retrieved January 30, 2011. ^ Preliminary Annual Report on U.S. Holdings of Foreign Securities, treasury.gov, August 29, 2014. ^ a b Stephen I. Schwartz; Bruce G. Blair, The Brookings Institution; Thomas S. Blanton and William Burr, the National Security Archive; Steven M. Kosiak, Center for Strategic and Budgetary Assessments; Arjun Makhijani, Institute for Energy and Environmental Research; Robert S. Norris, Natural Resources Defense Council; Kevin O'Neill, Institute for Science and International Security; John E. Pike, Federation of American Scientists; William J. Weida, Global Resource Action Center for the Environment (1998). Atomic audit: the costs and consequences of U.S. nuclear weapons since 1940. Brookings Institution Press. pp. 3, 12, 105, 107, 461, 546, 551. ISBN 978-0-8157-7774-8. ^ "The peak U.S. inventory was around 35,000 nuclear weapons. The United States spent more than $5.5 trillion on the nuclear arms race, an amount equal to its national debt in 1998 ..." Graham, Jr., Thomas (2002). Disarmament sketches: three decades of arms control and international law. USA: University of Washington Press. p. 35. ISBN 978-0-295-98212-0. ^ "...the total figure will likely be equal to the $5 trillion national debt. In short, one quarter to one third of all military spending since World War II has been devoted to nuclear weapons and their infrastructure ..." p. 33, Steven I. Schwartz; Nuclear Weapons Cost Study Committee (November 1995). "Four Trillion Dollars and Counting". Bulletin of the Atomic Scientists. Educational Foundation for Nuclear Science, Inc. 51 (6): 32–53. ISSN 0096-3402. Retrieved August 24, 2016. ^ Historical Budget Tables, whitehouse.gov; accessed August 24, 2016. ^ Cecchetti, Stephen G. et al. (March 2010). "The future of public debt: prospects and implications", p. 3. Bank for International Settlements [website]; retrieved July 4, 2011. ^ "Debt to the Penny (Daily History Search Application)". ^ "The United States enters the twilight zone – MuniLand". Reuters. May 3, 2012. ^ "Table 7.1 – Federal Debt at the End of Year: 1940–2016". Historical Tables. Office of Management and Budget. Archived from the original on May 16, 2011. Retrieved May 16, 2011. ^ "The-privateer.com, 1940–1960". The-privateer.com. Archived from the original on July 16, 2011. Retrieved May 18, 2011. ^ "The-privateer.com, 1961–1971". The-privateer.com. Archived from the original on July 16, 2011. Retrieved May 18, 2011. ^ "The-privateer.com, 1971–1979". The-privateer.com. Archived from the original on May 13, 2011. Retrieved May 18, 2011. ^ "The-privateer.com, 1979–1986". The-privateer.com. Archived from the original on July 16, 2011. Retrieved May 18, 2011. ^ "The-privateer.com, 1987–1997". The-privateer.com. Archived from the original on July 16, 2011. Retrieved May 18, 2011. ^ a b "The Debt Limit: History and Recent Increases" (PDF). Retrieved May 18, 2011. ^ "Republicans Raise US Debt Ceiling to $9 Trillion, Caused by Iraq War and Tax Breaks for the Rich". Usliberals.about.com. Archived from the original on August 7, 2011. Retrieved August 7, 2011. ^ "FINANCIAL AUDIT- Bureau of the Public Debt's Fiscal Years 2008 and 2007 Schedules of Federal Debt" (PDF). Retrieved August 7, 2011. ^ "Understanding the Federal Debt Limit". The Concord Coalition. Archived from the original on June 10, 2010. Retrieved August 7, 2011. Bonner, William; Wiggin, Addison (2006). Empire of Debt: the Rise of an Epic Financial Crisis. Wiley. ISBN 0-471-78253-X. Johnson, Simon; Kwak, James (2012). White House Burning: The Founding Fathers, Our National Debt, and Why It Matters To You. Pantheon. ISBN 978-0-307-90696-0. Macdonald, James (2006). A Free Nation Deep in Debt: The Financial Roots of Democracy. Princeton University Press. ISBN 0-691-12632-1. Wright, Robert (2008). One Nation Under Debt: Hamilton, Jefferson, and the History of What We Owe. Mc-Graw Hill. ISBN 0-07-154393-7. Wikimedia Commons has media related to United States government debt.